We are committed to provide products of utmost quality and specifications. Our products are made keeping in mind the standard norms of quality as well as maximum customer satisfaction and are of International quality. All equipment''s are subjected to stringent quality tests to ensure accurate output reaches our clients. Our clients blindly trust us to provide them with superior design, consistency and reliable products. We have installed a system of total quality control in all our processes to ensure that our products meet the highest standards acceptable by the industry.The quality control starts right from procurement of raw materials from trusted suppliers. This raw material is put through quality tests before using them in the manufacturing process. Our manufacturing process has an automated quality control system. We test each part for wear and tear, corrosion and impact resistance. All the road construction equipment''s and machinery that we manufacture meet the technical standard specification of "Ministry Of Surface Transport" and we assure to provide you a flawless range of products.Having a vast experience in the industry, we have earned a name for ourselves in the market of manufacturing and exporting high quality products, timely delivery as well as providing excellent services to our customers at an affordable price. Clients are our chief focus. We believe that if our clients profit, we will profit and grow automatically. Since the very start, our management has laid emphasis on delivering quality business solutions to our clients rather than just selling products. We built long term relations with our clients and our clients always come back to us for repeat orders. Our process starts with understanding the exact requirements of our clients and designing and manufacturing products suited to their exact needs and likes. We are a client-centered organization and we are proud of the fact that we have a great client satisfaction record. We try our best to deliver the best of products at reasonable prices. 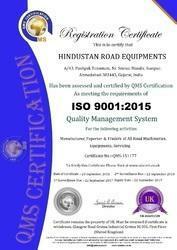 Through our excellent product range, we have earned the trust and confidence of numerous industries.Our consistent work approach as well as customer centric business approach has helped us in understanding and meeting the varied road construction plant machinery equipment demands of our customers. Further, our capability to deliver these in customized specifications and at competitive prices has also helped us in making many quality conscious customers in the Indian markets.Being entitled as one of the most prominent manufacturers requires lot of efforts and commitment. Our company is executing the business with dedication and perfection for a long time. Since our establishment, we have followed a client centric approach which has helped us in attracting a large clientele across the country. We have a great client satisfaction record due to the long-lasting and healthy relationship, which we offer them with a personal touch other than being too professional and this attitude has turned out to be our greatest strength. With quality and customer satisfaction as our main focus, we develop products as per the client's specifications.